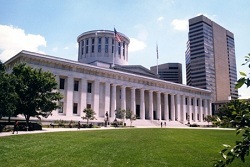 BioOhio will once again hold its popular legislative networking event for BioOhio members only in the beautiful Ohio Statehouse in the spring of 2016. BioOhio takes this opportunity to recognize lawmakers that have shown particularly strong support of our industry, through introduction of bills, support of policies, and creation of initiatives that benefit growth of bioscience in Ohio. Lunch, featuring brief remarks from special guest speakers, will be held in the Statehouse Atrium from 11:30am-1pm. If you are interested in scheduling meetings with your district’s legislators before and/or after lunch, please email jgoldsberry@bioohio.com and we will help coordinate meetings. Each year BioOhio invites Ohio lawmakers to join us and our members at the Statehouse for an opportunity to discuss the impact and importance of Ohio’s bioscience companies, research institutions, and educators. BioOhio is grateful to our national partners PhRMA, BIO, and AdvaMed, global pharmaceutical leader Pfizer, and member company G2G Consulting, for their support of this event. Attendees have the opportunity to schedule meetings with your district’s legislators and/or members of the Ohio Bioscience Legislative Caucus throughout the day. Members of the Ohio Bioscience Legislative Caucus include: Representatives John Boccieri, Terry Boose, Andrew Brenner, Steven Huffman, Sean O’Brien, Bill Patmon, John Patterson, Mark Romanchuk, Michael Sheehy, Marilyn Slaby, Kent Smith, Robert Sprague, and Senators Cliff Hite, Frank LaRose, and Joe Uecker. Email jgoldsberry@bioohio.com and we will help coordinate meetings.